Australian father Adam Koessler did what any dad would do when his child has a severe disease — he looked for any possible treatment, however far-fetched. 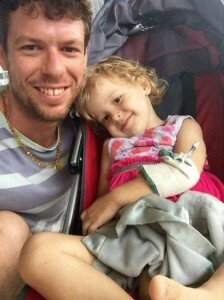 But Koessler’s search for a miracle only led to his arrest after he provided his 2-year-old daughter, Rumer, with cannabis oil to treat her stage 4 neuroblastoma. Koessler was charged for supplying dangerous drugs to a person under 16 years old as well as possessing dangerous drugs. According to The New Castle Herald, Koessler said he had been traversing from Cairns to Brisbane for a meeting with her oncologist on Jan. 2 when he was arrested. Neuroblastoma is a cancer that develops in the nerve tissue of the adrenal glands, neck, chest, or spinal cord. Stage 4 is the most severe kind, and means the tumor has spread to lymph nodes or other parts of the body. Koessler claimed that the cannabis oil, which he had mixed with coconut and infused into his daughter’s food, had caused a remarkable change in Rumer. Despite this, Australian authorities still believe that marijuana is classified as one of the most dangerous drugs and therefore shouldn't to be administered to even the sickest children. While several U.S. states have legalized medical marijuana, there is no law in Australia that allows for medical use of cannabis, and the drug is still placed in the most restricted category of drugs next to heroin. Rumer and her mother pose in a picture posted on "Rumer's Recovery"
The arrest has infuriated medical marijuana advocates, who claim that cannabis can be essential in treating very sick patients. However, this isn’t the first time a sick patient has been denied the right to use cannabis in the treatment of their illness. An Iowa man suffering from an aggressive form of cancer who grew his own marijuana in order to keep his tumors under control was placed on trial last year after being arrested, even though he claimed the cannabis saved his life. Despite the crackdown on users of medical marijuana in countries and states where it’s not legalized, more and more evidence is accumulating that shows how compassionate — and effective — cannabis can be for certain diseases, like seizure disorders and cancers. More children suffering from severe epileptic seizures are currenty being treated with cannabis, and the results are incredible. And a recent study found that cannabis has the ability to shrink brain tumors due to two of its ingredients: tetrahydrocannabinol and cannabidiol. Meanwhile, the Herald reports that since being taken off the cannabis oil, Rumer’s condition has declined and she’s now drugged up on morphine in the hospital's intensive care unit. “I saw first hand that the cannabis oil was extremely beneficial and I hope I simply did what any father would do,” Koessler said. To read more about Rumer and her recovery process, check out her Facebook page.